I came back from the US a couple of weeks ago, seems like much longer now, but whilst I was there I was able to do a great swap with the absolutely lovely G of Nouveau Cheap, yes Queen of Affordable Cometics. I was able to bring stuff with me to the US to ship to G and she sent me the most amazing package filled with brands that were new to me. Amongst the goodies were some milky glitters from Nanacoco – a brand I had never registered before. This is the first one I have to share with you and is called Shu Cream. Shu Cream has am mikly cream base, packed with glitter that is white, orange and bronze, with the tiniest turquoise glitters. The website states it is in the gold family. It really dinged my bells. Now a quick word about the smell…. if you know or have tried Kleencolor then you will know what I mean about the smell. It is quite chemically and rather strong. So a ventilated area is a must. And if you are sensitive to smells, you will want to avoid this as it does linger. Anyway, i also paired this with something I have been DYING to try – which is the new peel off base coat from Sally Hansen. Now I have tried a couple before and its always been a bit hit and miss. So I did two thin coats of the SH Big Peel Off Base coat before applying two thickish coats of Shu Cream. First coat was a drop and spread as it felt a bit gloopy, but that might have been because the peel off base coat once clear is a bit tacky. Second coat was a bit thicker to capture lots of that lovely glitter! Gosh, I love this. Its almost work appropriate glitter isn’t it?? I topped with a layer of Nails Inc Kensington Top Coat to seal it all in and that also helped to reduce the smell. As for that SH Big Peel Off Base Coat? Man that is a WINNER. The polish lasted two showers, numerous hand washing before I chose to peel it off. And it was satisfying to peel off. It came off in big pieces and left no residue behind. I was super impressed. Huge thanks to G for the swap, more swap lovelies to come over the next few posts! 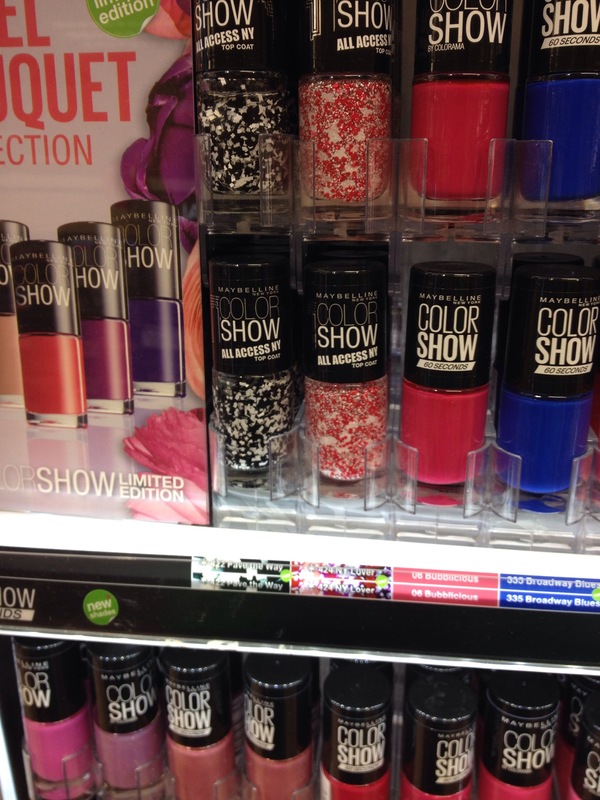 Further to my quick post on the new Maybelline Color Show All Access NY top coats, I’ve now seen a fully updated stand. Seems that we are only getting the black and red toppers, not the others as seen in Europe as on the Gemey-Maybelline Site here. First up, a close up of the red and white topper. Yes there are hearts in there. Below is that stand has has the inserts updated. You can clearly see the two names. Also note that the Color Show bottles have been updated with 60 Seconds on them… Moving along the display, you are see there are more than the two Dr Rescue products I saw in another stand. 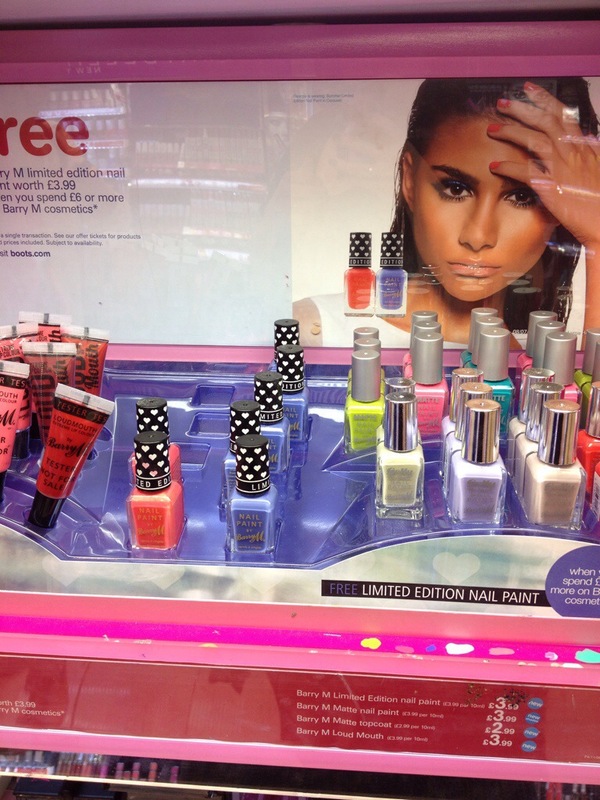 Seems there are four of them – from left, All in One, Gel Effect Top Coat, Base Coat and SOS Balm. Curious to see what that last one, the Superdrug website doesn’t help. Did you pick up any of these this weekend? Let me know what you’ve spotted in the comments! My mani consists of Cult Nails Tempest for the white and OPI A Woman’s Prague-ative for the shimmery orange. The nail vinyls I used to make the chevron shape came from She Sells Sea Shells and were very easy to use. Basically, you paint your base coat, then leave it to dry longer than you would think. Apply the vinyls where you want and then use your accent colour. Then whilst they are still wet, peel off the vinyl, probably using tweezers. If your base coat is still too tacky, it sticks like glue and its hard to pull off! Anyway, its something so simple even I can’t completely mess it up! Let me know what colour combinations you would try in the comments. This is Cupcake Addicted, another of the Manhattan Birthday Nail Polishes. This is a german brand that seems to have really upped its game and I fell hard for these in the store. Even this one, with pink in! The above image shows the entire range of polishes and we’ve already seen one from the Blogger Collection and one from the Birthday Collection. Lets check out the pics! This is a creamy white polish with pink glitter in. It also has a slight shimmer to the base which brings it beyond a basic creme polish. What you see above is two or three coats over a base of Nailtiques 2 and topped with G&G HK Girl. Why two or three? I needed to have a fair amount on the brush so that the glitter didn’t drag and pull up to the free edge. There was a bit of streaking going on. However, nothing that cannot be navigated with a bit of care. What is nice is that the glitter does end up nice and flat on the nail. Top coat provides smoothness. And can I just say, the wear on this is excellent. These aren’t readily available in the UK, but I have spotted some on eBay and perhaps you might have a german or austrian buddy to call on. I’m so excited to share this polish with you – sent to me by the lovely lovely Lindz who saw my post about the European Edition Maybelline Color Show Acid Wash (you can see it here) and then made it her mission to find me one. She is a star and I am very grateful to her. Now I just LOVE this, but then I am quite a fan of the Acid Wash polishes, but I know not all of you are fans. I am sightly obsessed with bright blue polishes and this one just ticks my boxes in all the right ways. As you can see, this is a bright blue with the white glitters from the UK editions of the Acid Wash polishes. They have big white matte glitters through to small white glitters. 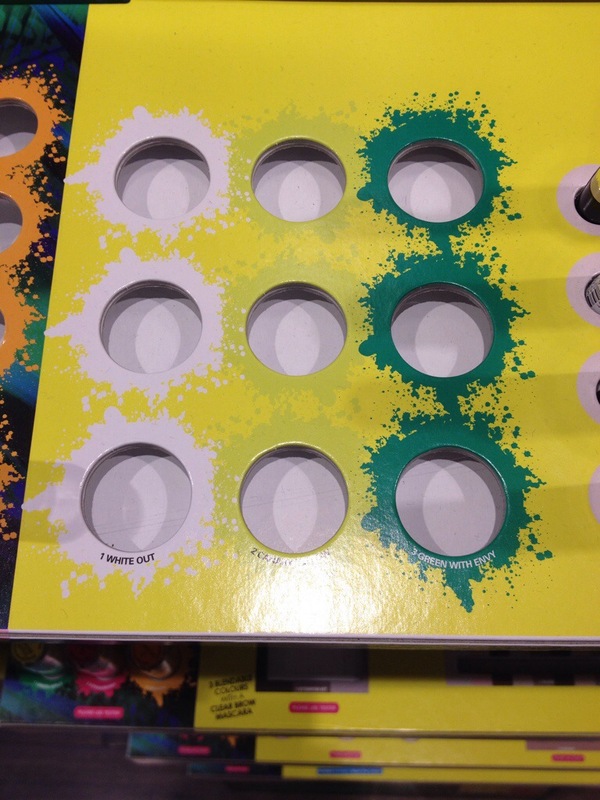 From what I can tell they are all matte. Formula is good, which is surprisingly considering the amount of glitter that comes out on the brush. This is two coats over a base of Essence Anti Nail Peeler (seems to be working) and topped off with a coat of G&G HK Girl. The glitter placement is good, although I did end up with one finger having five large pieces of white glitter on – more than any one nail needs – but other than that, I felt it was a good mix of sizes. The top coat does help level off the glitter so if you have a little bit sticking up it does really help. I do think Maybelline has been knocking great polishes out of the part, I would imagine we might see these in different colour ways in the autumn and winter collections. They seem to be bang on the money when it comes to glitter collections. 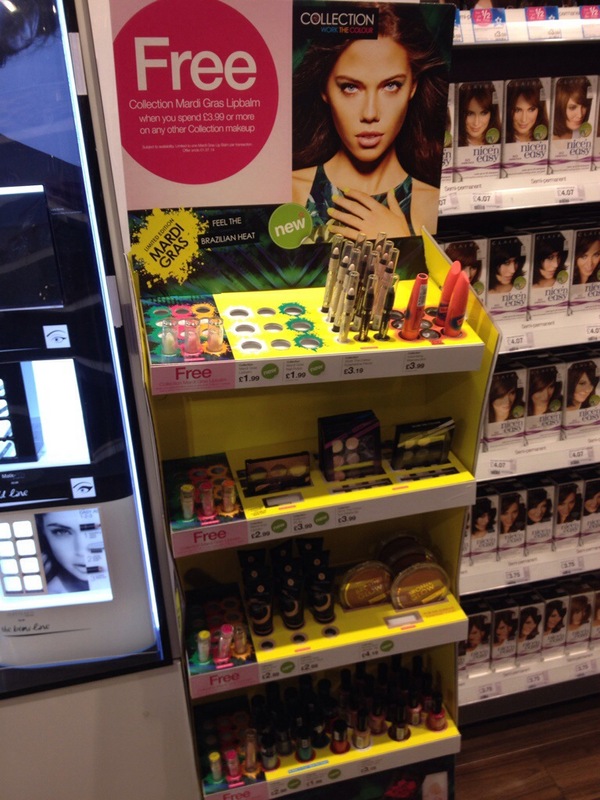 Two very quick spots for you today – first up, the Collection Mardi Gras range is now is Superdrug stores. Having had empty stands for a week, I’ve now seen this in three stores. I’m kinda digging the yellow! Then I spotted the new limited edition Barry Ms for summer, these are the two available in Boots. There is a different pair available in Superdrug. Short and sweet this time – anything catch your eye? 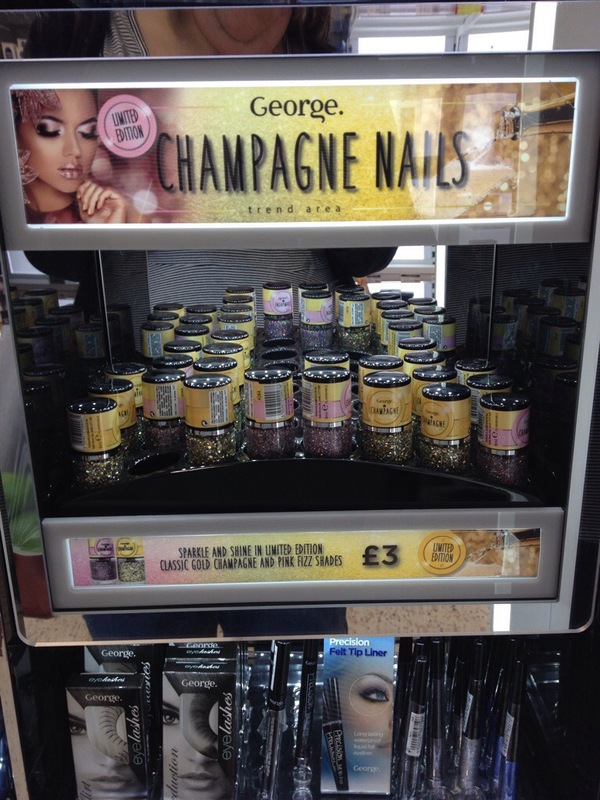 I know a lot of you have already stumbled upon these Champagne polishes in ASDA, but this is the first time I have seen them in person. Not bad at £3 each. They only come in two colours, pink and gold. 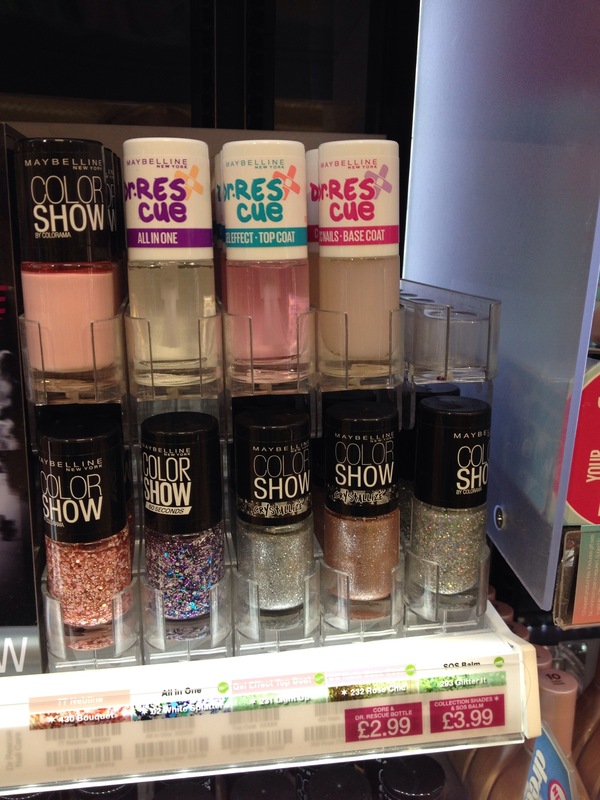 Then I spotted the empty Mardi Gras collection stand – as you can see, there will be three shades in the polish line up. A white, a citrus yellow/green and a leaf green. So just a few bits to keep you out of mischief this time out. Have you picked out any of the collections above yet? Final polish from the Maybelline Color Show Acid Wash Effects to share with you today. To recap this is the glitter on its one that we see in the coloured shades of Ripped Tide, Lilac Rebel and Mint-Acid-Ittude in a clear base so that you can pop it over any polish you want or make jelly nail sandwiches. Lets look at the pics. This is over a base of Essie Hide & Go Chic, a demin blue creme. I was trying to avoid doing white glitter on black or green. Application here is super easy, this is two one swipe coats over the base colour. I only have one other pure white glitter polish, but the glitter is all the same size in that, so this is a nice variant. Not much more to say really, its lovely and if you don’t have a white glitter in your stash then you might want to pick this one up. Otherwise its probably one you can skip.